I'll probably reprise this rant vocally on my weekly podcast. I've never been one to be at the forefront of popular culture trends. When I first connected online in 1997, I signed up for America Online. Yes, AOL. Its unreliable dial-up tended to kick me (and presumably everyone else) offline every hour or so. And yet, I stuck with it, as well as its outrageous monthly fee (in hindsight), for the sake of staying connect with my friends. Instant messaging! (It was either that, or ICQ, which I have no idea how that worked.) Yes, peer pressure at its best. Around the turn of the millennium, people started to jump ship from AOL and Earthlink and Juno, etc. etc. for the exciting new world of DSL. You get phone calls while surfing the Web! Fast downloads on Napster! Being about $50 a month at the time, such a jump in technology was a little too expensive. Alteratively, many of my high school friends left to (relatively) distant lands for college...and with it, came tuition-paid T1 Internet access. Those formerly attached to AOL could continue their Instant Messaging on AOL Instant Messenger, or AIM. As far as I can tell, AIM still has a following, though I have no logged on AIM in more than five years. Around 2003, a couple of close friends introduced me to Xanga and Friendster. I also stumbled upon MySpace at the time, but thought nothing of it until 2004. In 2005, I was introduced to Google Video by a friend, who's friends with an inside source. While that was cool, I was on my last few months of dial-up (yeah...late), so I didn't have much use for that. I think I uploaded one video using a friend's DSL connection. Later in 2005, Youtube showed up, and while I thought highly of it, I didn't have the time yet to switch my $20 per month AOL dial-up to a more useful $20 per month DSL connection. Evidently, Youtube got big. At the time, I was teaching a couple of high school fine arts/applied arts classes, so I observed secondhand the popularity of Youtube (and Myspace, but I was part of that too). In the meanwhile, AOL changed its business model and is essentially free for the few who stuck around. I still have my account, by the way. And now there's Shelfari (social networking for books), LinkedIn (for people with careers), Twitter (for stalker-friendly people? ), etc. etc. Not to mention LiveJournal and Blogger, which I've failed to mention before. And Garage Band and PureVolume (for musicians). And podcasts. And video podcasts...or are they called video blogs (vlogs)? So where was I? The whole World Wide Web scene is pretty overwhelming. People collecting "friends" and/or fans...for whatever purpose, in hopes of fame or money or both. Anyway, I've run dry on this rant. Here's to Search Engine Optimization (SEO)...and spam! Here's another earth-moving tale, according to family legend. This time, the story is from my mom's side of the family. Her dad, my grandpa (a skilled carpenter), had built a grand house for his wife and several children. Unfortunately, the property it stood on wasn't as good as it could be, so he and my grandma bought a better piece of land on the other side of town. Unwilling to let their magnificent home go to waste (or to another owner), they called upon their cousins (my grandpa's or my grandma's, I am not sure), who lived in the hills. They were said to be giants (probably greater-than-average in stature, but I won't ruin the fantasy element with factuality). And so the Giants descended from the Hills, to help my grandpa move his house. They took the building by its foundations and lifted. The ground shook (probably not, but stick with me here). With the house in their hands, a house large enough for a family of 11 (with pets), the Giants began walking. They marched down the small residential street that led to the main boulevard of the town. They passed neighbors' homes, or rather former neighbors' homes. They passed the town park, the school, the church, and City Hall. The townsfolk didn't know whether to be amazed or afraid. Here they were, a worthy band of Giants. And there it was, a three-story house ever-moving across town. For who other than the Giants from the Hills could bear this weight? At the other side of town, on land that my grandparents had purchased, the Giants gently put down their kinsman's house, which stands there to this day. So I read a book. High five! I have yet to return to a book store / library / .com superstore to pick up another one to read. And so it was, I returned to my skimming ways. I read the entire Harry Potter series on Wikipedia. Speaking of seven-book series, I "read" Piers Anthony's Incarnations of Immortality series...on Wikipedia. It was a great "read"...so great, that I wish Anthony can find a publisher for the eighth book, Under a Velvet Cloak, so I can read the summary on Wikipedia. If you're in the middle of an actual book, and it's a particularly good book, the formula seems invisible. When you read summary-upon-summary on Wikipedia, then story formula is clear. It reinforces the pattern of formula that has permeated throughout our history as storytellers. This is not to say formula is inherently bad. To be formulaic is bad, because it reduces literature (or cinema or music) to a paint-by-numbers scheme. There's something about using classical "stock" characters or age-old storylines - tastefully, of course - that seems to work, to resonate within our (for the most part) collective humanity. Think about it. A lot of great stories has the elder mentor (a stock character) sacrifice himself/herself (age-old storyline) for the protagonist (another stock character), or for the greater good (age-old storyline) - often for both. You fill in the blanks in terms of song, literature, or cinema. If done well, that cliched plot point works. Otherwise, if a storyteller really wants to be "innovative," it would be theoretically effective to take something familiar and turn it on its head...as seriously as possible. A little satire might work, but outright parody probably won't last the ages as high art (but could make some money, if that's your M.O.). But then again, this is a re-illiterate's opinion, so it might not hold that much weight. Lightning has always fascinated me. Diablo II: Lord of Destruction is one of the few genuinely fun computer games to play, even though it (combined with the original, non-expansion game Diablo II) is about seven years old. Anyway, in between some serious business, I engaged in even more serious business: demon huntin'. So check out this compilation of the Diablo II cinematics, which may or may not be a coherent story in and of itself. I haven't written a book report in such a long time...since grade school perhaps (general education college courses at the latest). Had I read Daniel Quinn's Ishmael as a teenager, at the height of the book's popularity, I would have read something groundbreaking, no, earth-shattering. Knowing what I knew then, and believing what I believed then, I wouldn't have known what to make of it. Takers? Leavers? Culture? Myth? Knowledge of good and evil? Living in the hands of the gods? Limited competition? Before picking up this book, I had acquired some of the knowledge and experience necessary to make my reaction to Ishmael rather uneventful. The telepathic, wise gorilla was seemingly preaching to the choir of one. With that said, Ishmael's lecturing was the best part of the book. The bits and pieces of "story" - The narrator answering an ad, the narrator trying to relocate his teacher, etc. - were, in my opinion, less interesting. Give me the propaganda directly. Give me the analysis in words that I wouldn't have written, but with ideas that are not new to me. The "story" part was rather frustrating. Anyway, it was an enjoyable read, probably because the concepts weren't difficult for me to digest. It wasn't an intellectual, philosophical, ideological challenge because most of that grand gorilla's concepts weren't new to me. I would like to discuss this book with someone who wasn't ready for Ishmael's concepts, or is in direct opposition to the gorilla. That would be interesting. I have since passed the book along to my brother, and I guess it won't be so groundbreaking to him, either. At least I'll be able to listen to Pearl Jam's Yield, consciously connecting some of the album with the book. It'll make for a new kind of listening experience. If memory serves me correctly (which it often does not), I used to read books - or the Cliff's Notes thereof (whenever it came to books relating to schoolwork, as time has never been on my side). Anyway, as business and art have eroded whatever leisure time I theoretically should have, I have not read a book from cover to cover in years. Of the printed word, in recent time, I have read the following: Periodicals, reference books (open an arbitrary page and read as little as possible), and coffee table books (mostly for the pictures). Of literature, as of late, I've downloaded free audio books (Creative Commons licensed mp3s of Public Domain books) at Librivox.org. And so I have elected to change my fate and thus picked up a book: Ishmael by Daniel Quinn. It inspired my favorite Pearl Jam album, Yield. While I still have about 100 pages left to read, here's what I know so far: The book is about a wise, telepathic gorilla (Ishmael) who communicates with the narrator, teaching the narrator how to change the world. It is more of a dialogue between the teacher and the student. Ishmael's analysis of the first few chapters of Genesis, how it relates to the beginnings of culture, was definitely a riveting read. I was pleasantly surprised how close my interpretation of the story of Cain and Abel was to the gorilla's (and thus the author's) interpretation. ...and let me know what you think. I'll be sure to write another entry with an official book report, as it were. As you can see, there have been some changes to this site. First of all, DeRamos.blogspot.com now redirects to DeRamos.org, which is hosted by Blogger. (Thanks, Google!) I really like the three-column layout, graciously provided by Template Panic. I used this same three-column Rounders 2 modification, with slightly different colors, on the Mutiny Universe Blog/Podcast site. Links to websites by the creator of this template can be found on the lower right hand corner of this page. Society of Gloves-related material can be found at the upper right hand side, while information pertaining to DeRamos.org's Daily Chord is right below, within the right hand column. Mutiny Universe-related material, can be found in the left column. Below MU's section is our fine selection of merchandise from our various CafePress.com stores. According to family legend on my dad's side, my ancestors were fishing on a boat. It must've struck a rock or something, but there was a hole in the boat in middle of the sea. Had it sunk, the occupants would have drowned, and I would have never been born (as I am in this universe). Fortunately, an eel sacrificed its life to plug the hole. And to that end, I personally honor its kin (by not eating them). OK, in addition to (and sometimes contrary to) my previous review, here's a further reaction to Zeitgeist. I've been listening to the album over and over (to get my money's worth, since I sure as hell didn't get my money's worth from Billy Corgan's TheFutureEmbrace). Last review (after one streaming listen from AOL's Spinner), I could only hear a little bit of Brian May guitar tone, as well as some Wyld Stallyns-approved riffage. Listening to the album over and over, with the speakers blasting and with my headphones on (during separate listens), there's a lot of Billy voice, more so than I had previously mentioned. It's everywhere. There are several ohs in the intro of "Starz" that I only heard with my headphones on. It's the Queen/Roy Thomas Baker treament - voices everywhere. Instead of a lead guitar overdub, it's a vocal chorus of Corgans. Last week I said, "It's more of a guitar-and-drums album." I take that back. Vocals are everywhere, not in a screaming or crooning or look at me kind of way. The drums are there and the guitars too, but there's so much voice as an instrument (not necessarily as vocals)...and the fact it's Billy Corgan's tone attached to that new instrument...strange and rocking at the same time. By the way, after listening to a record label-sponsored podcast called "Inside Zeitgeist," I have a newfound respect for the requisite epic "United States." Last time I wrote, "The requisite Corgan epic, 'United States' is in the same league as Machina's 'Glass and the Ghost Children,' which is to say it's not as strong as 'Porcelina of the Vast Oceans' or 'Mary Star of the Sea.'" I sort of take that back. While "Porcelina" and Zwan's "Mary" are high on my list of epic songs, "United States" is significantly better than "Glass." Why? In the interview, Jimmy Chamberlin said that he recorded the entire nine-minute drum track straight through, no click tracks, no pro tools (which I'm assuming means both the program Pro Tools and a generic term like xeroxing and photoshopping). Hell, it's Jimmy Chamberlin for crying out loud. The song is longer than nine minutes, it's essentially a drum solo (according to Chamberlin and I concur somewhat), and there are several tempo changes - musical movements. That's my glowing re-review. I'm just glad I got my money's worth from buying the album. But the best lyric of the album has to be at the end of "7 Shades of Black," where Billy sings "as St. Patrick pipes on! "...which is probably a self-reference, seeing as Patrick is his middle name and that he was born on his middle-namesake's day (I think...). After much hassle (i.e. iTunes kept on rejecting my password until I restarted iTunes), I finally downloaded JC/BC, Zwan Zwei, the Halfing Pumpkins...the Smashing Pumpkins' rebirth album Zeitgeist. I gave a quasi review of it last week. I suppose Billy Corgan's photo montage is trying to show the death of the Smashing Pumpkins...the Billy-D'arcy-Jimmy-James Smashing Pumpkins. There's a funeral photo with a coffin full of old school Pumpkins icons: D'arcy's rat bass, the 90's SP heart, and action figures of Billy, D'arcy, Jimmy, and James. Somewhere along the way, there's a rebirth of the Pumpkins as BC/JC (they admit to it, complete with the AC/DC font). I would rather call them JC/BC, since that actually rhymes with AC/DC, but I guess Billy needs to be first. That's Billy for you. I have yet to hear the iTunes exclusive track "Stellar," as I'm listening to the requisite Corgan epic "United States" right now. I'm four tracks away from the bonus track. Included are the MySpace/Spin Magazine covers by...for lack of something meaner to say...emo bands. I already listened to the Spin CD, and I wasn't impressed. I think I liked the "Ava Adore" cover the best. As much as the Pumpkins sound can be heard in modern-day emo, you can also their influence in good ol' rock and roll bands...like, I don't know, The Society of Gloves. 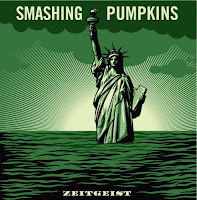 Artist: The Halfing Pumpkins, Zw, JC/BC...I mean, the Smashing Pumpkins. Verdict: Mostly Machina meets (Brian) May. I've already heard the first two singles - "Tarantula" and "Doomsday Clock" - and I like those two songs (excellent single choice). They've either instantly struck a chord with the fanboy in me ("Tarantula") or grew on me ("Doomsday Clock"). There's a lot of Machina in the guitar tone, due to the half-step down and lower tuning. (Standard tuning is partly why the Zwan album sounded a lot like Gish and Siamese Dream.) I'll have to let it grow on me. "Starz" instantly struck a chord with me. Yes, that's "Starz" with a "z." It sounds like artistic growth to me...in a good direction. At first, it has a "Tonight, Tonight" vibe, but it grows into something more than that. And Jimmy Chamberlin does a DRUM SOLO on this one (as is his right, being elevated to Producer status). The requisite Corgan epic, "United States" is in the same league as Machina's "Glass and the Ghost Children," which is to say it's not as strong as "Porcelina of the Vast Oceans" or "Mary Star of the Sea." Those are THE Corgan epics, or should I say, Corgan/Chamberlin epics. The second half fares better than the first half. "Bring the Light" and "Come On (Let's Go)" are both instantly impressive. "For God and Country" sounds like Depeche Mode, and "Pomp and Circumstances" channels Queen, thanks to "Bohemian Rhapsody" co-producer Roy Thomas Baker. In fact, there's a lot of Queen-meets-Machina in the guitar tones and harmonies (guitar leads and vocals). Corgan tries his best oohs and aahs on this album. Noticably missing are Corgan screams, but that's pretty much been absent - as far as new compositions go - for the past decade or so (Mellon Collie). 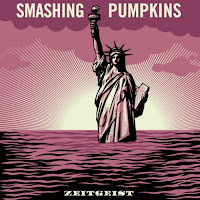 It's more of a guitar-and-drums album...as were most Pumpkins albums (other than Adore). In short, other than the two singles and the three songs that instantly won me over (which I've typed in bold), I'll let the rest of the album grow on me. Anyway, don't take my word for it. Listen to the entire album one week before it is released at AOL's Spinner: http://music.aol.com/songs/new_releases_full_cds. I wrote a first impression "review" of Pearl Jam's Live at the Gorge 05/06 at the Mutiny Universe Blog. Now that I've listened to all seven discs, here's the verdict: Awesome. The price of admission alone covers the following: Ed and the crowd playfully taunting Tom Petty ("Hello Tom, come down Tom!") both in 2005 and 2006, Ed's two solo renditions of "I Won't Back Down," and Mike channeling Hendrix for a full band version of "Little Wing." The rest is icing on the cake...some damn good icing.